I always try to choose pleasant and picturesque routes for our bike rides. For that reason I always like to carry my camera and a couple of lenses handy. 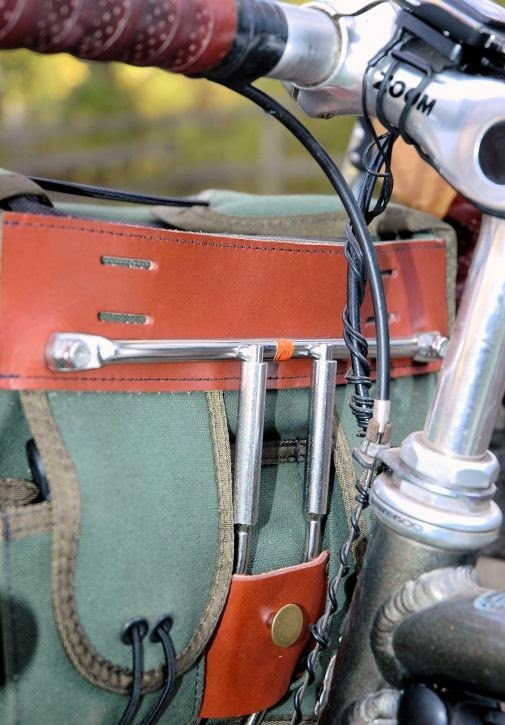 The handiest place to carry them is in a handlebar bag where they will be within easy reach on demand. Of course it takes a sizable bag to carry a DSLR and a couble of lenses. 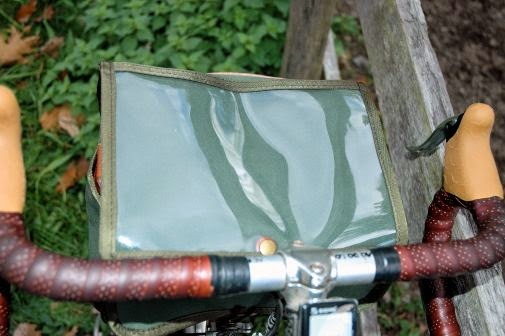 I had fitted my bicycle with such a bag equipped with the ingenious KLICKfix Handlebar Adapter. I discovered in short order that the high and forward mounting with this arrangement, combined with the weight of the contents, unpleasantly affected steering and bike-handling, and I right away started searching for an alternative. One possible solution was a KLICKfix adapter that bolted to the steering tube, below the handlebars, however I wondered if this plastic support for my handlebar bag would be up to the weight of a camera, two lenses and miscellaneous other items, especially on these rough New England roads. 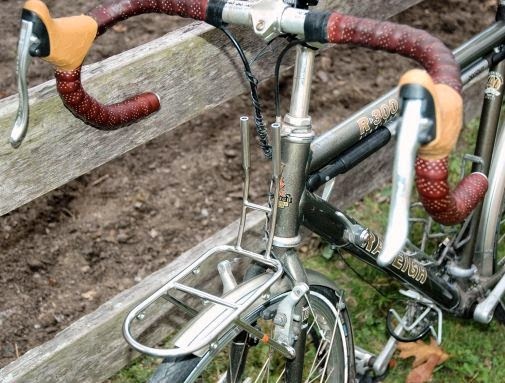 The failure of one of the brackets on my handlebar mount this summer confirmed my fears. 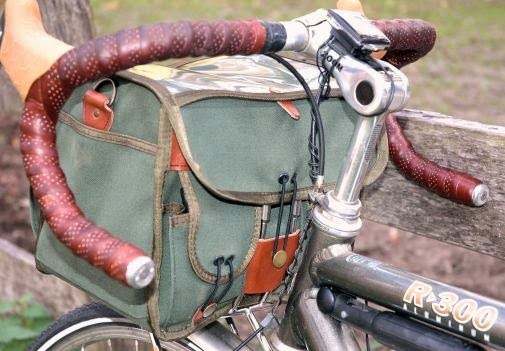 In the course of my searching, I had come across the so-called French-style handlebar bags, which are designed to rest on a small rack above the front wheel, and traditionally attach to the handlebars, or to a décaleur affixed to the stem. 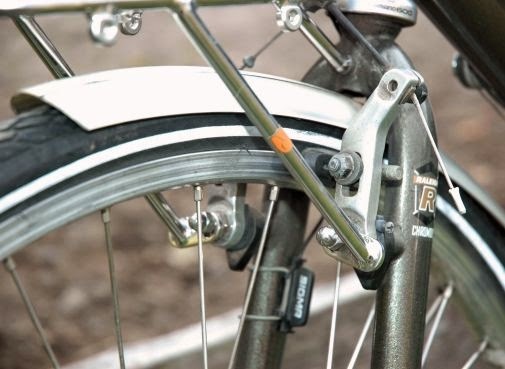 This lowers the load and brings it closer to the bicycle, thus improving the handling and balance. Since the load is supported from underneath it is also more stable and secure. This all seemed so sensible to me, but these accessories are rather pricey. 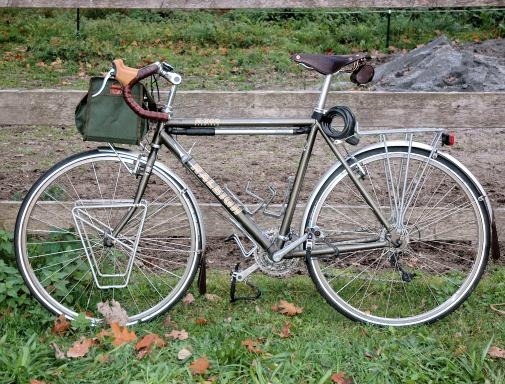 My research led me to Velo Orange which carries its own line of French-style bags, racks and décaleurs at a somewhat more reasonable price. 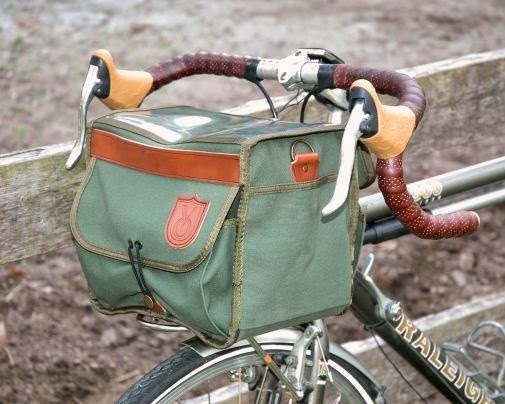 I chose, for my purposes, the Velo Orange Grand Cru Handlebar Bag and the Pass Hunter Front Rack with Integrated Décaleur. The bag rests on small front rack. I found that, even though secured to the décaleur, and possessing an internal stiffener, the bag flopped easily from side to side. The bag can be secured to the rack by passing a strap through webbing at the bottom. I did this and it eliminated the floppiness. 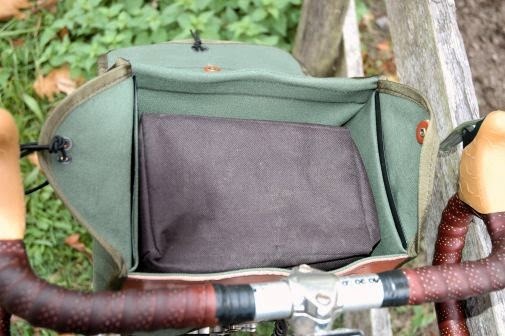 Velo Orange Grand Cru Handlebar Bag -Front quarter-view showing large front pocket. The bag has a large main compartment, a large front pocket, two small back pockets, two shallow pockets on the sides and D-rings for the included shoulder strap. Rear opening, (hinged at front,) top cover secures with an elastic strap to button on rack insert tab. rear quarter-view showing small back pockets. The top cover sports a generously-sized clear-view map pocket. The top cover opens conveniently facing the rider for easy access. 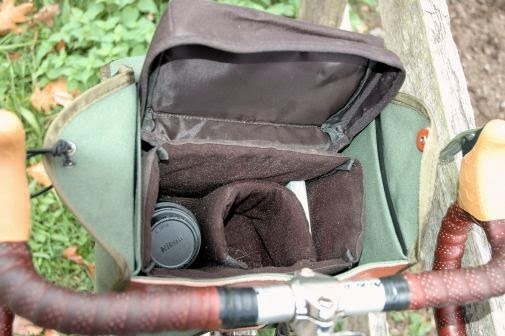 The Grand Cru Handlebar bag easily contains my camera insert with room to spare for a few odds and ends. The insert holds my camera , two lenses, and a few odds and ends. The bag rests on this small front rack. 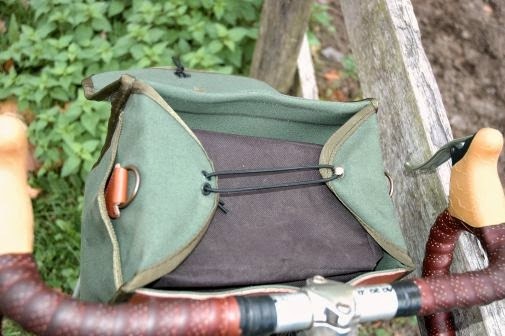 The Pass Hunter rack has an integrated décaleur -- a device to which the top of the bag is attached to steady the bag, yet leave the handlebars unencumbered. Bolted onto the top back of the bag is a bracket with prongs that slip into the décaleur sockets to steady the top of the bag. The Pass Hunter rack support struts bolt to the cantilever brake bosses via included double-ended cantilever bolts. 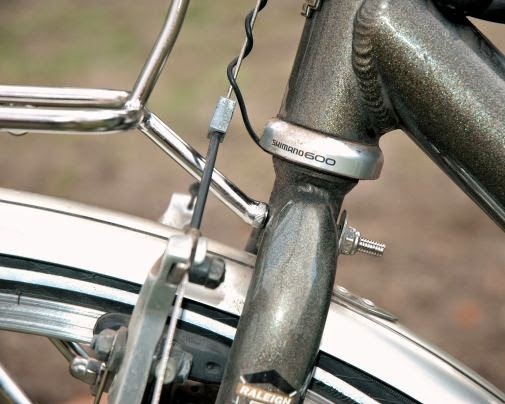 The rear support strut of the Pass Hunter rack bolts through the hole in the middle of the fork crown. On my bike this hole had a threaded boss at the rear, which I had to drill out. I had read horror stories of failed and/or mickey-moused installations of this rack. Luckily for me, everything lined up the way it should, and came together very neatly. The rack tilts backward slightly. I could have used spacers between the rear strut and the fork crown to correct this, but I like the bag leaning in toward me a little, so this is perfect for me. 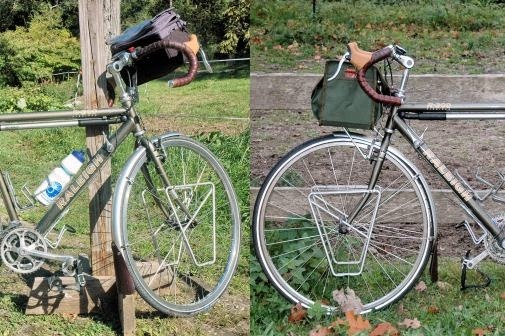 Here's a comparison shot of how much lower and further back the weight is carried with a French-style décaleur bag versus the popular handlebar quick-mount bags of today. Steering and security are much improved. I think it's esthetically better-balanced as well. 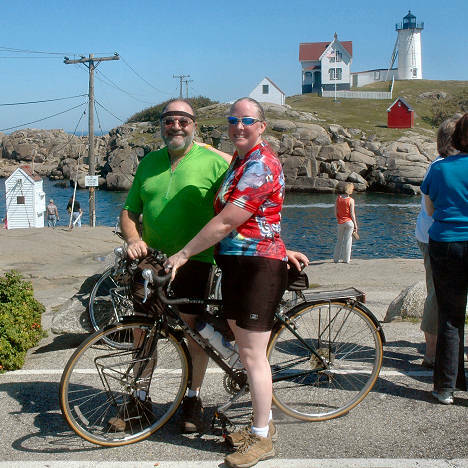 Looking forward to my next picturesque bike ride! 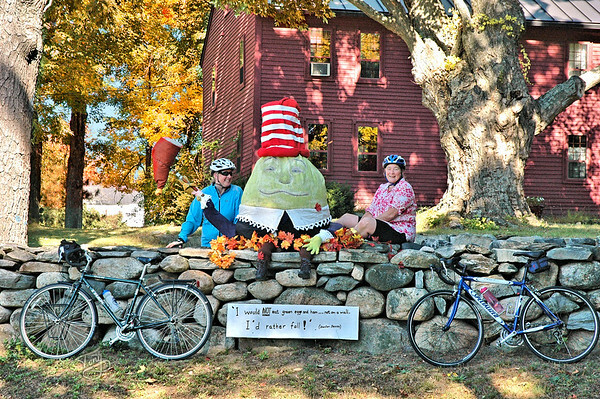 On this lovely Sunday afternoon, Debbie led us on a delightful 13 mile bike-and-walk tour of some of the Chester, NH Scarecrows, a yearly tradition where the townsfolk wax creative and adorn their yards with imaginative, charming and humorous scarecrows. We had a great time and got quite a few pictures. Check out the gallery or slideshow.